For The Addams Family School Edition, click HERE. For The Addams Family Young@Part®, click HERE. Take a look at the trailer from the National Tour! Hundreds of years ago, the Addams family ancestors came from the old country and settled on a plot of land in what is now New York’s Central Park. This was, of course, long before it was a park, when it was still wilderness. The family flourished for many generations, and eventually, a huge house was built where a great Spanish oak, the Addams Family Tree, had been planted to protect the ancestral graves from such annoyances as sunlight and tourists. As the curtain rises, the last dead leaf of autumn falls from the Family Tree, and all is right with the morbid, macabre world of Gomez, Morticia, Fester, Grandma, Wednesday, Pugsley and Lurch. They’ve gathered – where else? – in the family graveyard, to celebrate life and death in a yearly ritual to connect with their past and ensure their future. 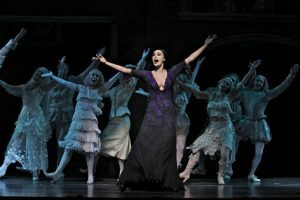 They seem at peace, not just with each other and their inimitable, unchanging Addams-ness, but with their dead ancestors, too – who emerge from their graves on this night each year to join in this celebration of continuity. But, at the end of the ritual, Fester blocks the ancestors’ return to their graves. Those unchanging Addams family values are about to be tested. Fester enlists their help to set things right, just in case a new family secret goes terribly wrong. What’s the secret? Wednesday Addams, that irresistible bundle of malice, has grown up and found love. So what’s the problem? The young man, Lucas Beineke, is from Ohio, and his parents are coming to dinner to meet the family. Two different worlds are about to collide. Will love triumph, or will everyone go home vaguely depressed? Gomez and Morticia are understandably wary. Wednesday is their baby, even if she is eighteen. Their doubts bloom into actual terror when they eavesdrop on Wednesday, who, in the midst of her afternoon play-date with Pugsley, refuses to torture her brother and involuntarily bursts into song – extolling all things bright and beautiful as love pulls her in an entirely new, and cheerful, direction. Like any parents faced with a child in terrible trouble, Gomez and Morticia wonder, “Where did we go wrong?” Wednesday begs her parents not to cancel the dinner, and exhorts the entire family to act as ‘normal’ as possible when Lucas and his parents arrive. She loves her family just the way they are, but they clearly fall outside the realm of what the Middle-American Beinekes are used to, and Wednesday’s afraid that, if his parents don’t approve of her, they’ll take Lucas back to Ohio, and she’ll never see him again. 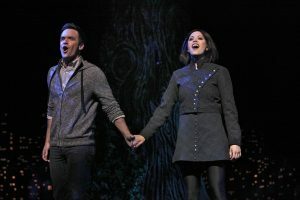 Like any unconditionally loving family, the Addams’ promise to do their best to oblige, while, lost somewhere in Central Park, young Lucas asks his parents to resist any judgments and all catastrophic conflicts, so both families can enjoy one normal night. In yet another part of the house, Pugsley, having witnessed Wednesday and Lucas making out, worries that he’s lost his best friend to her new, disgustingly sunny disposition. Plotting to break up the happy couple, Pugsley steals a volatile potion from Grandma’s private stash – Acrimonium – one swig of which is guaranteed to bring out the dark side in anyone who drinks it. After what is likely a less-than-normal meal, Wednesday hushes the table for Lucas’ surprise announcement. But Gomez reminds Wednesday that, before anything else happens, it’s time for the traditional Addams family game, “Full Disclosure” – during which everyone takes a sip from a sacred chalice and reveals something they’ve never told anyone. Gomez uses his Disclosure to try, again in vain, to calm Morticia. Fester announces that he’s in the throes of a most unlikely love – with the moon. When it’s Wednesday’s turn, Pugsley seizes his chance! He secretly pours the Acrimonium potion in the chalice and passes it to his sister. But his plan to awaken the dark side in Wednesday goes horribly wrong when Alice, coughing, intercepts the chalice and downs the potion instead. A whole new Alice, very dark and uninhibited, is born. The powerful poison prompts her to reveal the long-buried problems with her marriage, humiliating Mal, who, fed up with all the weird and creepy events of the evening, makes to leave, with Alice and Lucas in tow. 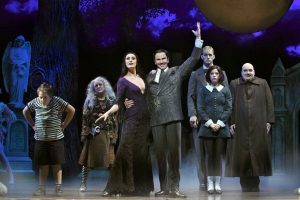 Wednesday blurts out the news: “Lucas and I are getting married!” Chaos engulfs both families like a tidal wave, and Fester, ever-helpful, urges the Family Ancestors to work some magic – whipping up a sudden, terrible storm and trapping the Beinekes with the Addams family for the night. While the storm rages, Wednesday packs a bag, but Lucas has no appetite for running away and getting married without his parents’ blessing. Wednesday, furious at everything it means to be normal, and furious at herself for trying so hard to become somebody his parents would accept,leaves alone. One more of Gomez’ episodes prompts Morticia to throw him out of her boudoir. Her world is changing and she’s not ready, and her only comfort is knowing that death is waiting for her, just around the corner. But it is very cold comfort indeed. In the guest room, Alice, under the influence of the darkness potion, can no longer rhyme. Neither can she tolerate her husband’s cynical attacks on Lucas and love. She packs him off with a pillow and blanket to sleep somewhere else, as the storm inside her heart, and outside in the park, rumbles to a conclusion. Once the rains have stopped, Fester heads outside for a couple of hours of moon-bathing, realizing – after observing the three couples fighting – the sheer luck of being in a long-distance relationship, with the distant silver orb in the sky that smiles down on him from the heavens. Sitting under the family tree, contemplating the twists and turns of this most unusual night, Gomez stops Wednesday on her way out of the park. He realizes the thing he was most resistant to – his baby girl’s growing up – is inevitable, and proper. He sees that she’s a young woman in love. And that makes him happy. And a tiny bit sad. With her father’s blessing, Wednesday offers Lucas one test to prove that he’s The One. The test involves her skills with a crossbow, an apple, and Lucas standing with said apple on his head in front of the family tree. The boy is afraid of death, but even more afraid of losing Wednesday. He chooses the possibility of death over the certainty of loss – and wins. Far below, in the grotto, Gomez and Mal, two displaced husbands, realize they have more in common than they would have dared imagine only a few hours earlier. While Mal is with Gomez, Lurch ushers Alice down to the grotto. She’s a woman on a mission; she’s going to lay down the law; changes must be made if the marriage is to survive. Morticia packs a bag and is ready to leave. But the ancestors’ spirits have led Gomez to find her. The other warring couples, Wednesday and Lucas, Alice and Mal, have made their peace. Now Gomez woos his wife, as he first did one night many years before, with the promise to “laugh and cry and dance until the very gods weep with envy.” The mournful strains of a bandoneon waft up on the breeze, entwining with the tempting wail of a violin – and a tango begins – the Tango de Amor, the quintessence of Eros, the dance that makes men weep and women cry out in the night. The irresistible expression of love between husband and wife. And Morticia cannot resist. 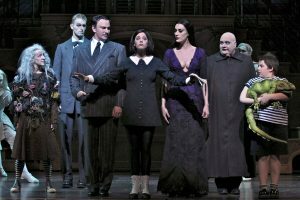 With all three couples reunited, Fester is emboldened to make his move, and launches himself to the moon. Landing safely, his face appears – the man in the moon – and, love having emphatically triumphed in heaven and on earth, the gate to the family crypt swings open, allowing the spirits of the ancestors to rest for another year. It’s been a night of darkness. Everything’s changed. And the new, extended family understands: The unknown may be frightening, the darkness overwhelming,but if we don’t run from it, we may see our mysterious, miraculous lives finally illuminated. If we move toward the darkness, we might find love and acceptance. For when it is dark enough, we can see the stars. A to Z Theatrical Supply and Service, Kansas City, MO. Makeup tips from Players Theatre, Sarasota, FL.